2011 Father’s Day Ties Are Here! It is with great honor that we announce the release of our annual Father’s Day tie. Keep it simple this year and treat your dad to a gift he’s sure to love: a case of ‘Gansett dressed up with this year’s signature necktie. This year there are 2 types to choose from. 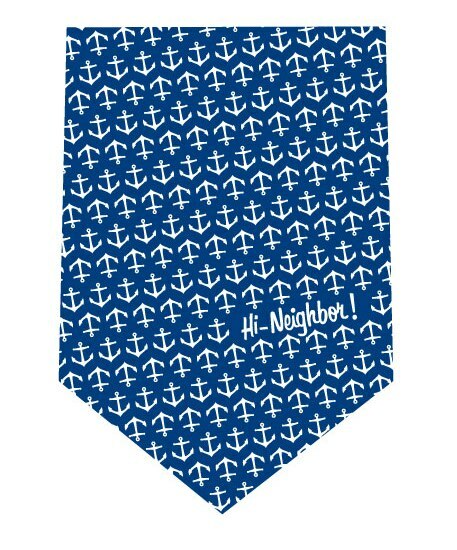 Both have the anchor design with the “Hi Neighbor” in it. One type is blue and is 4″ wide and the other is a red skinny tie that is 2″ wide. The 2011 limited-edition necktie was created by Brookline, MA resident Amanda Zoglio, originally from Warwick, RI. Narragansett Father’s Day ties are available, while supplies last, from May 16 – June 19.
in-store purchase of any ‘Gansett 18-pack, 12-pack or any combination of 2 6-packs. Ties will also be sold online here for $10 each. Pics with Pops: Submit your photos of Dad drinking ‘Gansett and/or wearing his Father’s Day tie and be entered to win a pair of Red Sox “Hi Neighbor” seats and Pawsox box seats. Spot the Tie: If you are spotted wearing a Narragansett tie between now and Father’s Day (June 19th) at an upcoming promo event you’ll enjoy prizes, such as ‘Gansett gear or a pair of Pawsox tickets. So wear your Gansett tie loud and proud. Click here to see the list of our upcoming events.